It’s a place I visit several times a week as part of my car-free journeys. You’d think the drama of the spot would have worn off by now. Yet every time I round this corner with my rollie suitcase or my laptop tucked under my arm, I stop what I’m doing and absorb the beauty. Since 1939, Union Station has been turning the heads of commuters and visitors alike, and this year, our grandest and most gorgeous structure turned 75 years old. There have been plenty of celebrations and commemorations for the station, but I wanted to point your attention to a book called Union Station: 75 Years In the Heart of LA, featuring essays about the station’s civic significance. I’m incredibly honored to say that I was asked to contribute an essay to the book, and my name is listed alongside my writing heroes like David Kipen, Marisela Norte, and D. J. Waldie. When I breeze through Union Station, making my transfer to the Metro Gold Line or catching the FlyAway to LAX, I’m used to seeing a wedding party posing for photos among the rose bushes of the patio, or a film shoot bringing the long-empty Old Ticket Concourse back to life. The picturesque passageways and their well-preserved artistry will always be the go-to stand-in for 1940s L.A. But in the last few years, with the staging of massive music performances like Invisible Cities, art-world spectacles (such as the recent Station to Station happening in September 2013), and critical civic moments, the role of Union Station has transformed from a period-perfect backdrop into an animated cultural concourse. 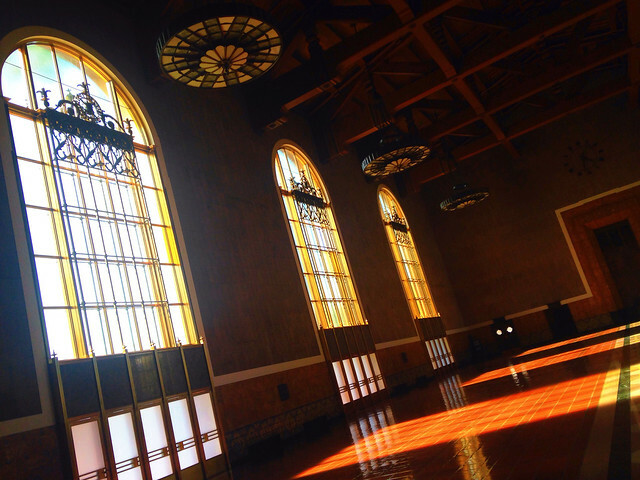 Now, in addition to being the connective tissue between the city’s nodes, for an increasingly transit-oriented Los Angeles, Union Station has become a crucial part of the destination. If you’re like me and enjoy some LA history mixed with some train nerdery, this book will hit the sweet spot. You can buy your copy here. A huge thanks to Heidi Zeller and Metro for asking me to contribute to this project. This entry was posted in building, writing. Bookmark the permalink.